In my opinion the best way to encourage language development is to read for at least 20 minutes every day and talk about things you do throughout the day. Bed time story is my favourite time of the day with her, we will sit together and go through the story and pick out certain parts and talk about them. So we decided to get The Julia Donaldson Story Collection*. When it comes to books for toddlers, Julia Donaldson can't be beaten and you'll find all these and more in this brilliant 10-book collection! Sure to quickly become bedtime favourites, our collection also includes Julia Donaldson stories that may not be as well known but are just as delightful. Another way to help encourage her development and her imagination is with her boxes of Happy Land toys, and so we want to look to add to her collection with this Happy Land Watering Can. 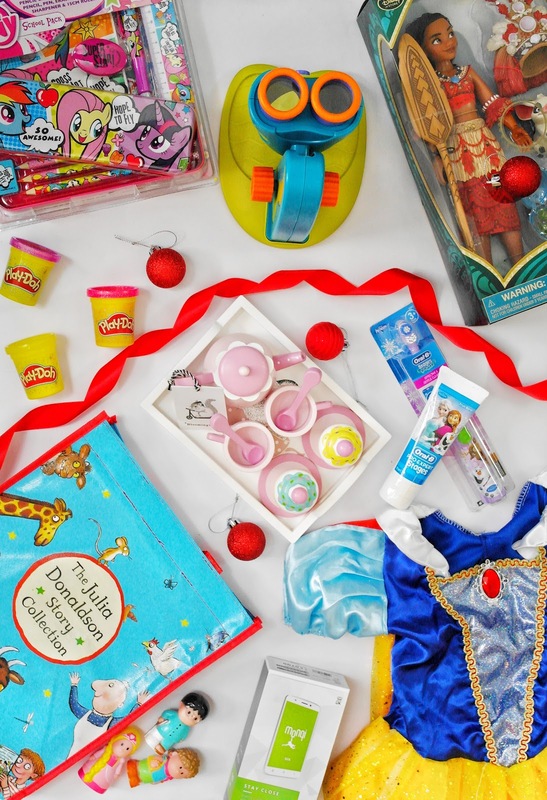 As you know my daughter adores princesses and so it makes complete sense to adding some dress up pieces into this gift guide for little girl. Ever since my daughter started nursery she has become so what obsessed with a Snow White dress and she keeps asking for one, as the one at nursery is a tad too small for her. Being in the digital age, children are obsessed and my daughter is just the same. And seeing as I have a brand new phone, I am a little more protective and so perhaps having her own mobile phone may be the solution. Monqi* is unique in that it’s a smartphone aimed for children and controlled by adults. The phone works in harmony with an app on the parent’s phone. The child’s smartphone is controlled via the app, which can restrict time spent on apps on the child’s phone, the apps they choose to download, how long they can spend on the phone and how many texts they can send. The safest smartphone on the market. For the more creative little girl. The GeoSafari My First Microscope* from Learning Resources is a wonderful introduction to magnification for preschoolers! Encourage scientific exploration and introduce your little one to a key scientific tool that is fun and exciting to explore! So we have been exploring everything from a fairy wand, pine cone to stones and sticks, you can magnify any flat or dimensional small object up to 8x it’s size, this is a real working microscope designed for kids and perfect for little hands! Play Doh is always a great option for your creative little girl, I mean what child doesn't like Play Doh and with this cake play set they will be able to do just that. Shape all kinds of cakes in the oven or with the cutters. Use the decorating tool to top it off with swirly make-believe frosting. For even more festive fun, this creative bakeshop comes with Confetti compound! Amara Living have an array beautiful toys but this one is a cut above the rest, seriously how gorgeous is this tea set? Enjoy afternoon tea with your little one with this Children’s Tea Party Play Set*. Crafted from wood, this set includes a teapot, two cups, two cupcakes and two spoons sitting prettily on a white tray. I know that my daughter will have hours and hours of fun with this little tea set, I can't wait to see her face. Finally, I managed to get my hands on a gift that my daughter has been begging for, for far too long. The Moana Singing Doll. Do you have a Moana fan? It’s all about the sunshine, greenery and beautiful scenery. Moana has all of this. Beautiful Hawaii, blue seas and amazing plant life. It's so much better. This singing Moana will be the perfect gift for our little lady and this doll comes with two beautiful outfits, detailed accessories, and a 'Wear & Share' shell necklace, just like Moana’s! Do you feel inspired? What gifts are your favourites? 7 comments on "Gift Guide: For Little Girls"
This is such a great gift guide! I love the smartphone idea! These look like such cute little gifts! I love buying play dough for my cousins, it’s lovely buying a creative gift and seeing their minds get creating! the childrens gifts this year have been so hard, my eldest is almost 8 and is going into the tech side of toys and my youngest is 20 months so its just so hard! I havent seen a gift guide posted at children before!! I love some of your ideas!! Thank you for this post! Have a brilliant Christmas! !